The Canadian Film Centre Annual BBQ Celebrating Filmmaking Talent @ TIFF, hosted by director/producer Norman Jewison, was held Sunday September 13 at Toronto's tree-lined, Windfields Estate, home of the CFC. The exclusive VIP gathering of Canadian/international filmmaking talent gathered to celebrate 'the independent creative spirit' with live music performed by The Arkells and numerous outdoor food/beverage kiosks, providing perogies, pizza, beef, chicken, veggie burgers, beer, wine and my fave drink(s) of the afternoon, the 'Aficionado', made with 'Belvedere Vodka', topped by lemon, white cranberry and sparkling elderflower water. 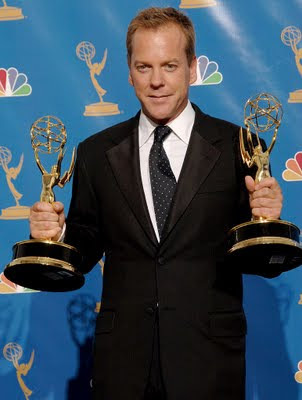 Special announcements included the CFC naming Emmy and Golden Globe Award-winning Canadian film actor Kiefer "24" Sutherland as Chair of the 'CFC Actors Conservatory', presented by Canwest and supported by the Brian Linehan Charitable Foundation, as Canada’s first professional level, cross collaborative on-screen training program for actors. The inaugural five-month session will launch September 21, 2009. “I am honored to contribute to Norman Jewison’s legacy by offering the CFC my passion for storytelling, for Canada and its talent,” said Sutherland. “Canwest’s investment in the CFC Actors Conservatory is part of a long-term strategy to nurture Canadian acting talent and enhance the quality of home-grown programming,” said Christine Shipton, Senior Vice President, Drama and Factual Content, Canwest Broadcasting. The CFC Actors Conservatory will offer actors a unique, 'transformative' professional on-screen experience, collaborating with industry experts through a series of workshops/master classes alongside international actors/directors/writers/producers with a primary focus on the acting process. Designed to build strategic relationships that ensure professional film and television opportunities for CFC actor graduates, a goal of the Conservatory is to systematically build a Canadian star system through a series of star building initiatives. The other notable announcement made at the BBQ, was an offer of federal/provincial infrastructure funding to construct new buildings for the CFC, according to former broadcaster, Conservative politician Peter Kent, Minister of State of Foreign Affairs ( Americas ) and Liberal George Smitherman, Ontario’s Deputy Premier and Minister of Energy and Infrastructure, with the governments of Canada and Ontario each investing up to $3.25 million towards the project. “These new facilities for the Canadian Film Centre will provide a home to nurture talent and ideas, promoting innovation and creating jobs in the film, television and new media industries”, said Kent. “Ontario is proud to be home to the Canadian Film Centre and support a strong presence in the film, television and new media industries," said Smitherman. “Over the past few years the CFC has grown to be at the forefront of 21st century entertainment,” said Slawko Klymkiw, Executive Director of the CFC. The project will involve upgrades to existing buildings as well as the construction of three new ones, providing additional space for film, television and new media program activities, as well as hosting CFC and community events. Total eligible project costs are estimated at $8,950,500, one of nearly 1,200 initiative across the province that will break ground thanks to $1.84 billion in joint federal/provincial funding under the 'Infrastructure Stimulus Fund'.